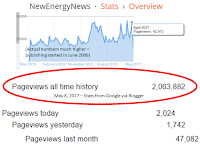 Thanks to Keith Rabin, a friend of NewEnergyNews, for sharing his interview. K.R. : Nobuo Tanaka took over as Executive Director of the IEA in September 2007. Previously, he had been Director for Science, Technology and Industry at the Paris-based Organization for Economic Co-operation and Development (OECD). Mr. Tanaka began his career in 1973 in the Ministry of Economy, Trade and Industry (METI) in Tokyo. Mr. Tanaka first joined the OECD in 1989 as Deputy Director of the Directorate for Science, Technology and Industry, and was promoted to Director in 1992. In 1995, he returned to METI and served in a number of high-ranking positions, the most recent being Director-General, Multilateral Trade System Department, Trade Policy Bureau. In the energy field, Mr. Tanaka was responsible for Japan’s involvement with the IEA and the G7 Energy Ministers’ Meeting during the second oil crisis. In the late 1980s, he helped to establish the comprehensive energy policy of Japan and oversaw the implementation of Japan’s international nuclear energy policy and negotiation of bilateral nuclear agreements. Mr. Tanaka worked on formulating international strategy as well as coordinating domestic environment policy and energy policy in the Kyoto COP3 negotiation. He was Minister for Industry, Trade and Energy at the Embassy of Japan, Washington DC from 1998-2000. Mr. Tanaka, has a degree in Economics from the University of Tokyo and an MBA from Case Western Reserve University, Cleveland, Ohio. N.T. : I served in the Japanese government at the Ministry of Economy, Trade and Industry for many years dealing mostly with international trade and energy issues. Much of my career has been spent outside of Japan. Several years ago I came back for my second assignment with the OECD in Paris. The head position at IEA opened and I was asked to run as a candidate. It was an interesting time for energy security and climate change issues and I was elected as the first non-European Executive Director. 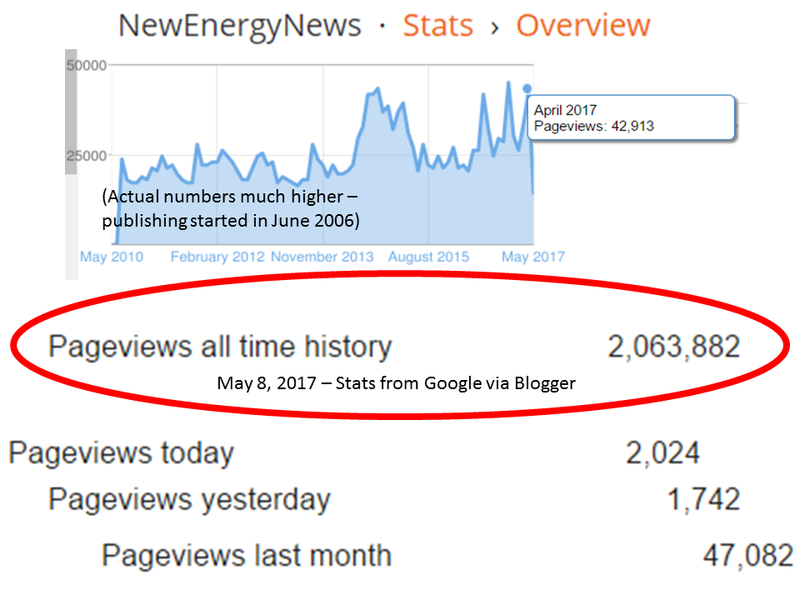 I started in September 2007 just before the price of oil started to escalate dramatically. 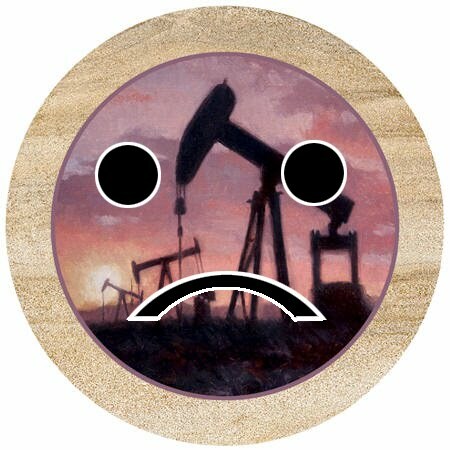 In 2008 it rose as high as $147 per barrel and it was almost like we experienced a third oil shock. Then it came down dramatically before it resumed its ascent. So there has been a lot of volatility during my time here, and it has been an interesting experience and challenge. K.R. : Can you tell us about the role of IEA in international energy markets and its history? N.T. : The IEA was established in 1974 at the time of first oil shock as consuming countries united to face the OPEC production cartel. The objective was to promote stability in the oil market through creation of a strategic stockpile. Currently there are 28 countries, each of which has a mandate of holding 90 days of their previous year’s imports. Our mission is to analyze the petroleum market and in case of emergency decide how much we need to release jointly to cool down the market. N.T. (con'd): In fact we have utilized this mechanism only two times. The first was in 1991 during the first gulf war when Iraq invaded Kuwait. The second was in 2005 when Hurricane Katrina hit the Gulf of Mexico. But this is an important function. When oil prices spike up, knowing it is there alleviates some pressure in the market even if we do not have to use it. With Brent crude now approaching $100 a barrel the market is getting tighter due to more positive trends developing in the global economy. So if we get disruptions and spikes due to unexpected factors we have this capacity in place to help alleviate any potential disruptions. K.R. : The IEA's 2010 World Energy Outlook forecasts with current policies the average price of a barrel of oil will exceed $100 in the next few years and by 2035 the effective price will exceed $150. Can you explain this as well as the "New Policies" and "450 Scenario" forecasts which could help to limit these increases? N.T. : Our annual outlook evaluates trends in the energy market and outlines scenarios for the future. It is not a forecast. In 2010 we constructed three alternatives. “Business as Usual” reflects current policies and under this scenario we see oil going to $150 a barrel in constant 2009 dollars. We believe that is the necessary price to balance current supply and demand factors. Under the “New Policy” scenario, which we view as likely, governments will focus on introducing measures to promote energy efficiency, conservation and a greater reliance on renewables. In this case we think it will rise to $113, also by 2035. N.T. (con'd): The third “450 Scenario” is based mostly on pledges announced in association with the Copenhagen Accord, as well as plans to remove fossil fuel subsidies. These reductions would require international agreement on a structured framework of policies as well as their implementation. Under this alternative, prices would go to $98 and then come down gradually. Achieving this alternative would also require a large increase in infrastructure investment. K.R. : Do current events in Egypt and the Middle East affect this thinking? N.T. : Of course the current situation has an impact on the price of oil. We view price movements to be impacted by various signals to the market, and since last autumn there has been a 30% increase in the price of oil. In hindsight we can see much of this has been caused by increases in demand in emerging as well as developed markets. Seasonal factors and weather also play a role. It is important, however, to determine what is a long-term trend and what is a temporary phenomenon. For example, many Chinese provinces reduced coal use last year and turned to diesel to realize 20% increases in energy efficiency targets. That increased seasonal demand, which is temporary, and caused supply to become tighter toward end of year. N.T. (con'd): As a result, stockpiles became lower and some OPEC countries raised production. This lowered free capacity, and we are cautious at this price level. If a $100 price continues for most of the year, we calculate the “Oil Burden” (Global Oil Expenditures divided by Global GDP) will exceed that of 2008, a year of abnormally high prices. If that happens this could undermine the global economic recovery. It is also problematic that this burden is much higher in emerging economies such as India or in Africa, and affects the poor in these societies. K.R. : What are the underlying factors driving these price rises? 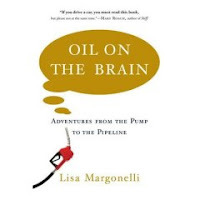 Is it more a "peak oil" scenario where we are exhausting existing supply, consumption increases in emerging markets, a failure to finance exploration activity, or a combination of these concerns? Additionally, how do you respond to analysts who believe most of the volatility we see is the result of speculators and hedge funds than real supply factors and fundamentals? N.T. : The economic recovery that has begun to take hold is increasing demand and the market is tightening. But we don’t deny that financial speculation does have an impact. The weaker dollar and recent political risk in countries such as Tunisia and Egypt certainly have an effect, which amplifies volatility, but in the end we think fundamentals are the primary driver. The trend is then accentuated by financial factors and the activities of investors and speculators, both on the upside and then when it turns down. K.R. : Oil prices have stayed quite strong in recent years despite the economic downturn. This leads one to wonder what the current price for oil would be if we were seeing stronger growth in the developed world. Wouldn't the higher prices that result from stronger growth act as a tax and impinge on the sustainability of a recovery? N.T. : We tend to take the consensus view from international organizations such as OECD and IMF as we are not macroeconomic forecasters ourselves. For 2011 we assume 4.3%. That is ½ % slower than 2010 and we are worried about the state of the global economy in the face of rapidly rising commodity prices. N.T. (con'd): At the same time we see far more spare capacity in OPEC and the OECD than what we saw in 2008. For that reason we think we have more of a buffer this year compared to that time. We also know there are geopolitical tensions that could potentially disrupt the market but do not see any reason to panic. At the same time, we cannot be complacent and need to maximize development both of new sources of energy as well as the policies needed to increase efficiency, alternatives and movement toward realization of our 450 scenario or a similar scenario. K.R. : One of the main challenges facing energy and resource markets is the very different needs and concerns of developed versus developing economies. This is particularly problematic when we talk about global warming as well as energy efficiency issues. How can these differences be resolved in a way that addresses both the needs of the emerging world as well as overall global and environmental concerns? N.T. : All countries need to contribute if we are to successfully tackle climate change. This is especially true of major players such as China and the US. Without them it is just impossible. Each country has different priorities. For example in some oil producing countries many still have much cheaper domestic gasoline prices due to fossil fuel subsidies when compared to exports. This sends a very wrong signal. They will be big consumers going forward – and we think they need to phase out the subsidies. We estimate fossil fuel subsidies amounted to $300 billion in 2009. That is huge and if a phase out happens we can save 2 gigatons of emissions and 5 million barrels of oil. This would be a big contribution and we strongly support this kind of action. In consuming nations better efficiency standards, greener building codes and development of alternative energy sources and supporting infrastructure are all important. For China, which became the largest energy consumer in 2009, much needs to be done in terms of efficiency and development of cleaner coal and carbon capture. So each region and country needs to contribute to mitigate the damage. We can only succeed if everyone contributes their fair share. K.R. 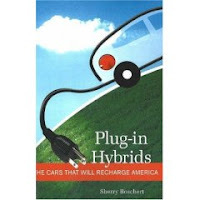 : We hear a lot of talk about the importance of alternative energy yet wind, solar, hydro, biofuels and geothermal are unlikely to serve as a significant replacement to petroleum for many decades. What is your view on the development of alternative energy sources both over the long term and the next few decades? N.T. : We don’t agree that they will play a minor role as renewables already play a major role in many markets starting in Europe, the US and China. There have also been significant increases in investment even in the midst of a major economic downturn. We see renewables having a 32% share of power generation by 2035 and if we are able to move to our 450 scenario this will go up to 45%. That is a major increase. 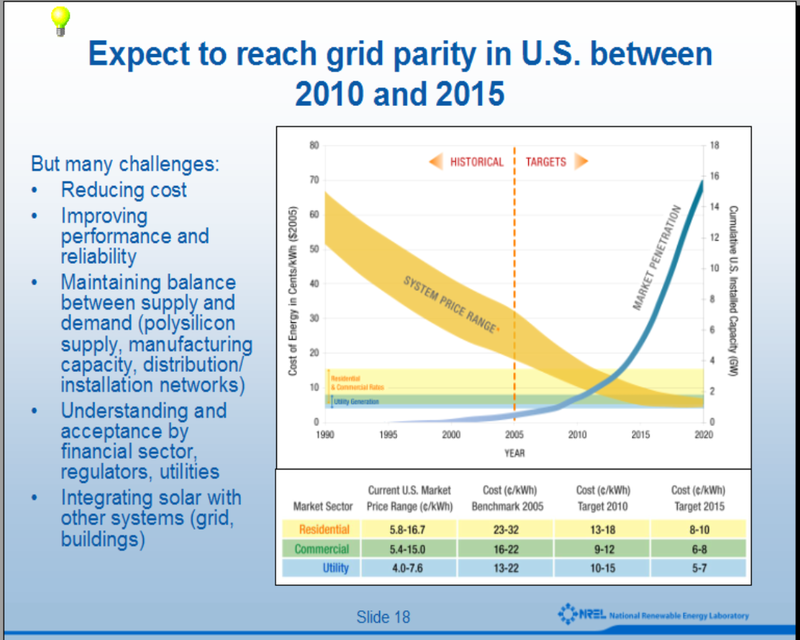 Costs are dropping rapidly for solar and other technologies and this will continue with more research and experience. So governments need to adopt the right policies and adjust their support systems. Valuation of carbon needs to be more transparent and steady and reflect true values and costs. Renewables also need to be integrated into the system and a smart grid developed and financed. Technology development is important but market design and policies are also critical elements to support this transformation. K.R. 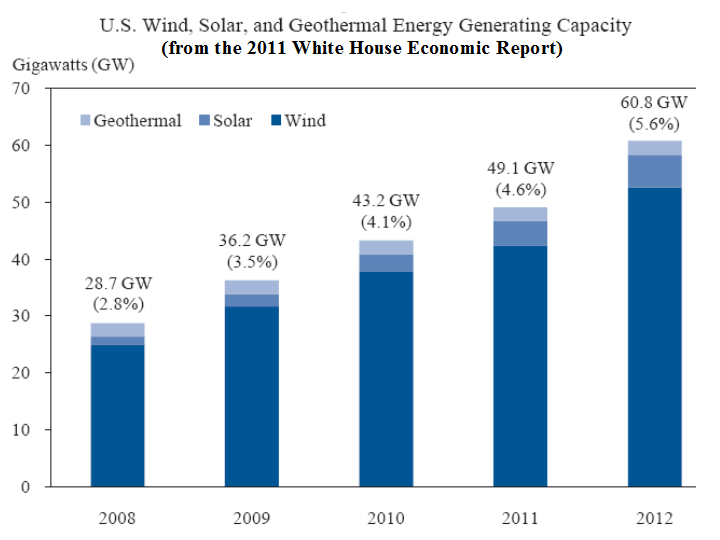 : In contrast to alternative energy most analysts recognize the immediate viability of nuclear as a power source. What is your view on nuclear as an energy source both in developed countries as well as emerging markets? N.T. : Nuclear is a very important part of the global energy portfolio. It is low carbon and relatively cheap compared to other sources. To reach our 450 scenario, thirty new nuclear plants need to be built each year until 2035. N.T. (con'd): For those countries that allow nuclear this is very important. Some countries, especially in Europe are negative, though others such as France and Finland endorse it. The issue is public acceptance and governments need to provide information, maintain safety and address nonproliferation concerns so this technology can be more fully utilized. K.R. : As we seek to transition to alternative energy there is concern developing over its reliance on rare earth and other specialty metals. Some analysts believe we are merely trading our reliance on hydrocarbons to these inputs. What is your view on this and how can we resolve this problem? N.T. : There are energy-reliant appliances and vehicles that use these metals as part of their process but in the end it is primarily a matter of cost rather than supply -- at least over the long term. Several IEA countries possess deposits of these specialty metals, and some have mothballed mining capacity that may cost a bit more to exploit than imports from foreign suppliers -- which is why these facilities ceased operations in the first place. 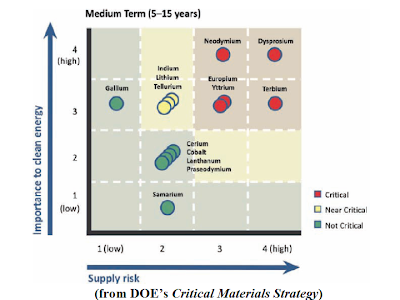 But the deposits are ready to mine, and so IEA countries are therefore not reliant on these suppliers for rare earths over the longer term, in the way for example that they are increasingly reliant for oil imports on those with significant reserves. K.R. : Given rising concerns over energy and resource supplies we are seeing political concerns emerge largely driven by economies that are nervous about potential disruptions. This is leading to diplomatic tensions, investments into supply by sovereign wealth funds, attempts by energy and commodity-producing countries to renegotiate production and exploration agreements with multinationals and other private companies, and resistance to allowing investments that would place these real assets in the hands of foreign corporations. How much of a concern are these developments and what are the implications moving forward? N.T. : There are plenty of resources underground and the risk of peak oil seems mainly to be above ground. This is due to resistance by national governments and limits in exploration budgets and longer term capital investment. N.T. : Under our long term scenario we see three price assumptions but in each case consumer prices remain high. In the 450 scenario it is $90 per barrel of oil, but countries have to add the cost of carbon emissions on top of that. 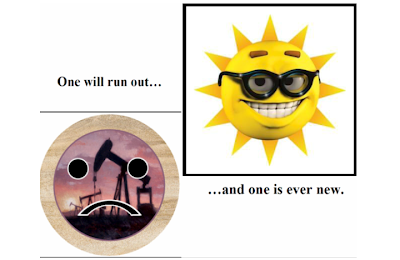 As a result, the real financial cost is almost as high as the $150 per barrel seen in the “business as usual” scenario. N.T. (con'd): As a result we can say the age of cheap energy is over -- regardless of which scenario emerges. That is something businesses and government need to recognize and then take steps to diversify technologies and capacity to enhance and address energy security. These measures are important both for growth and development as well as for climate change and security. K.R. : Ultimately, the use of energy and its resulting environmental impact is a global issue with global implications. At the same time given the difficulties and perceived ineffectiveness of operating on a multilateral basis, we are seeing increased movement toward national, bilateral and regional approaches. Is this perception fair? How important is multilateral cooperation in resolving energy concerns and what can be done to increase cooperation moving forward? N.T. : Multilateral cooperation is indeed important. After Copenhagen and Cancun there has not been a global agreement but our view is we can’t wait for a global deal as that will take time. And if we wait the cost of mitigation and addressing important energy and climate issues will get higher and higher. For example, we calculate the cost of enacting measures pledged in the Copenhagen accord would require $1 trillion to achieve the 450 scenario and the cost gets higher and steeper by 2020 as we get closer to the target year of 2035. N.T. (con'd): As a result we participated in the Clean Energy Ministerial meeting in Washington last July and called for action in these areas. Countries know what they have to do and have established goals. They need to start as soon as possible so this kind of “bottom-up” approach can help achieve progress until a global accord can be developed. N.T. (con'd): When we calculate the domestic actions of countries like China they are significant. Interestingly it is often far easier for countries to act locally than to commit themselves formally within a global framework. That is often overlooked. So when we aggregate what is being done it is significant and if the desired progress is achieved it will lower what they need to do globally. Mexico is also doing more domestically with their forests, energy efficiency and other programs. K.R. : Thank you Tanaka-san for your time and attention. Before we conclude do you have any final words you would like to leave with our readers? N.T. : That is all for now. Thanks and look forward to speaking again soon. 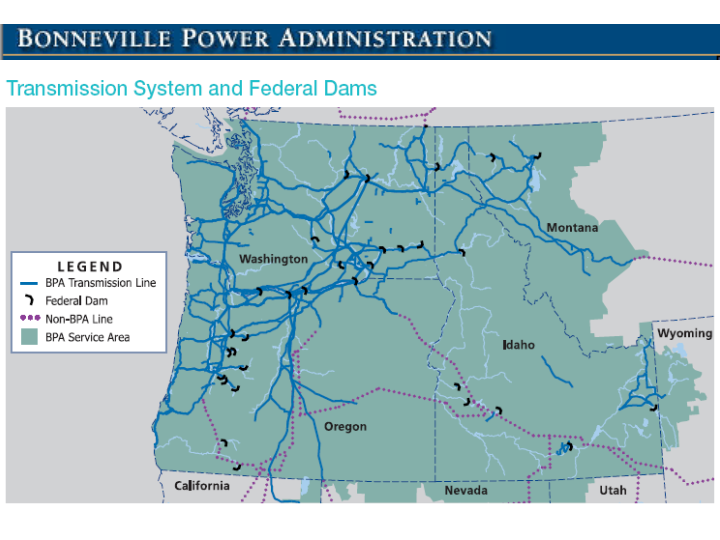 "The Bonneville Power Administration is taking a clearly different approach to its growing wind resource than Idaho’s public utilities…[I]t generated over 3,000 megawatts on its grid for the first time [February 22 from ~2,100 turbines on 35 privately developed wind farms primarily east of the Columbia River Gorge,] producing enough electricity to serve a city three times the size of Seattle for an hour. Utilities commission to reduce the cap for wind and solar projects they have to buy power from at a set rate from 10 megawatts to 100 kilowatts. The utilities argue that they have so many wind projects coming on line they could end up having more power than they can use or sell at some parts of the year." 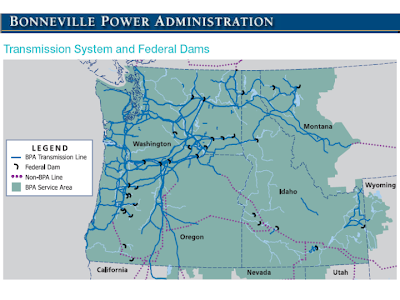 "…[To] accommodate 6,000 megawatts or more of wind, BPA is expanding and reinforcing the transmission system to support wind integration. 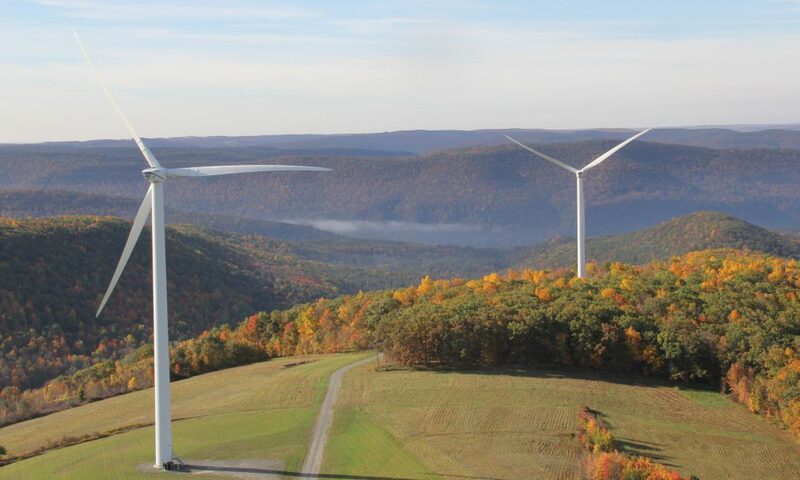 The agency is exploring additional measures to balance wind more effectively, other sources of generation to balance wind and is developing partnerships with other utilities and the wind community to expand wind integration even further." 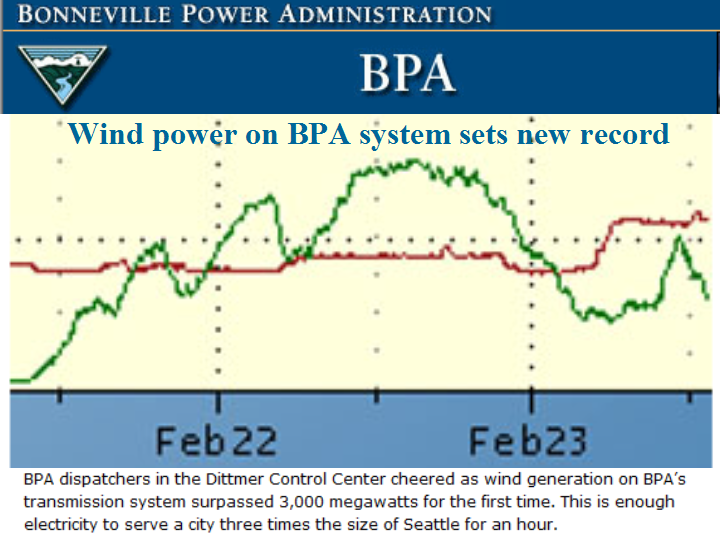 "…To make [wind] power more useful, BPA is developing a state of the art wind speed and wind generation forecasting system. The new system will forecast more accurately up to three days in advance rather than the previous [one-hour ahead] forecast service…That will allow BPA to integrate wind into its other power sources better and more cost-effectively…"
"…[I]t’s worth taking a measured look at the environmental impact of photovoltaic technology from cradle to grave…[Makers of] crystalline silicon-based photovoltaic solar panels, which currently boast about 80% of the global market…have borrowed much of their technology from the electronics industry, which relies on an abundance of chemicals and energy-intensive steps that pose risks to human and environmental health. "..[T]hey must instead choose more environmentally friendly manufacturing processes and plan for the panels’ safe disposal…[C]ompanies are increasingly setting up programs that will collect and recycle panels after their 20–25-year lifespan, with some businesses committing to not sending their products to developing nations in which other electronic waste is processed unsafely…"
"…[C]ompanies are looking to reduce the amount of energy required to produce photovoltaics, thereby improving the bottom line and environmental profile of manufacturing. 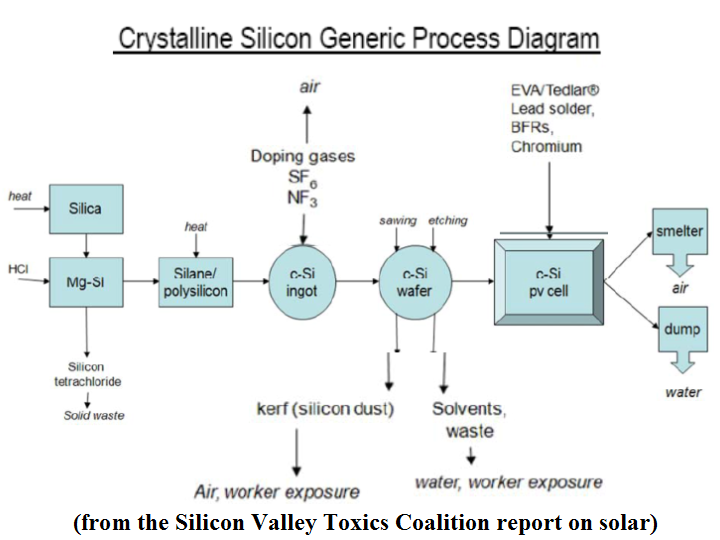 Researchers in both academia and industry are also starting to scrutinize the photovoltaic production process to figure out which chemicals could and should be replaced. 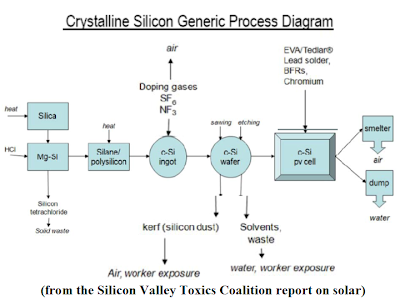 "…[C]rystalline silicon must be in use about two years before the cumulative energy they supply to the grid balances the energy required to produce them—the so-called energy-payback time…Many scientists have tried developing more-energy-efficient ways to purify and crystallize silicon…But none of the fledgling processes outperform the industrial status quo…[W]orse, much of the crystallized silicon goes to waste…Finding a way to recycle…would reduce waste across the industry…Turning a cut wafer into a usable solar panel involves a series of wet-chemical etching steps…[M]ore benign chemicals…[are being tried but few] perform to industry standards…"
"As companies figure out how to establish effective recycling programs for retired photovoltaic panels, as well as how to make those panels in more sustainable ways, they will have to continue to balance priorities that are sometimes at odds. Improving the energy efficiency of cells will make the energy payback time shorter…[but require mopre chemicals and water.] Resolving these challenges will ensure that photovoltaics don’t just produce renewable energy but are themselves renewably produced." Reuse and Recycling of Electric Vehicle Batteries will Ensure the Completion of ‘Green Car’ Tag; Analysis from Frost & Sullivan finds that EV battery recycling will become a significant part of the value chain by 2016, when significant quantities of EV batteries will come through the waste stream for recycling. 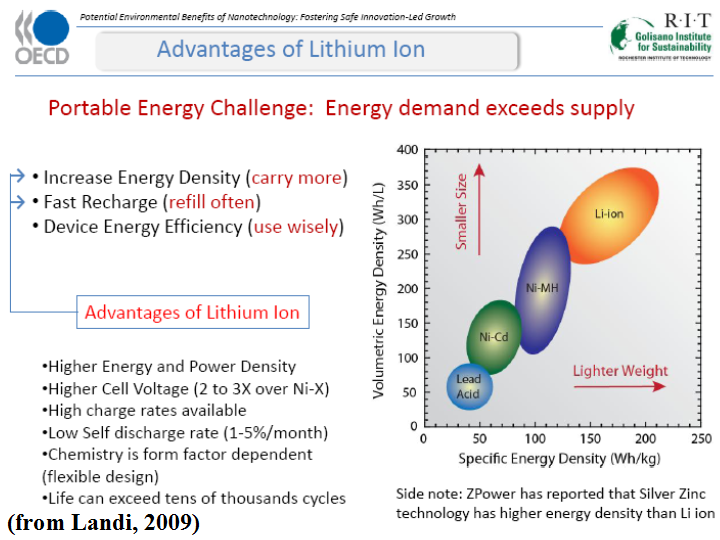 "…[T]here is little economic sense to recycle lithium-ion (Li-ion) batteries…[because they] contain only a small fraction of lithium carbonate as a percent of weight and are inexpensive compared to cobalt or nickel…[but] if the number of electric vehicles (EVs) and their associated battery packs increase in the long term, recycling and reuse will help validate the tag, ‘green car’. Reuse and recycling ensure that the energy source of EVs are in a closed loop and complete a full lifecycle. 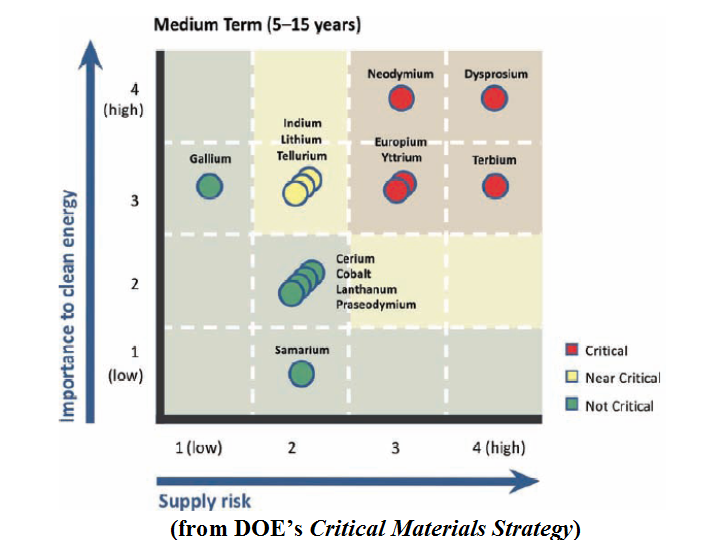 "…[New analysis] finds that EV battery recycling will become a significant part of the value chain by 2016, when significant quantities of EV batteries will come through the waste stream for recycling. The EV Li-ion battery recycling market is expected to be worth more than $2 billion by 2022, with more than half a million end-of-life EVs’ battery packs becoming available for recycling through the waste stream…"
"For second life, Li-ion batteries will have to compete with dedicated batteries used for current second-life applications such as stationary grid storage. 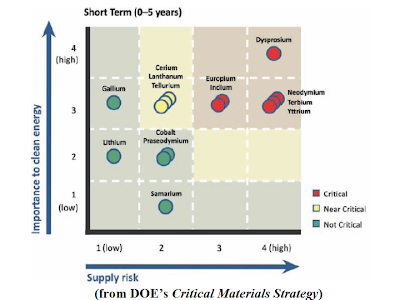 They will have to compete in terms of cost, power and energy storage, as most of the characteristics of Li-ion batteries with regard to their degradation at reuse are still uncertain…"
"Though lithium is 100 per cent recyclable, the battery-grade lithium from the recycling process is costlier than lithium from direct sources. 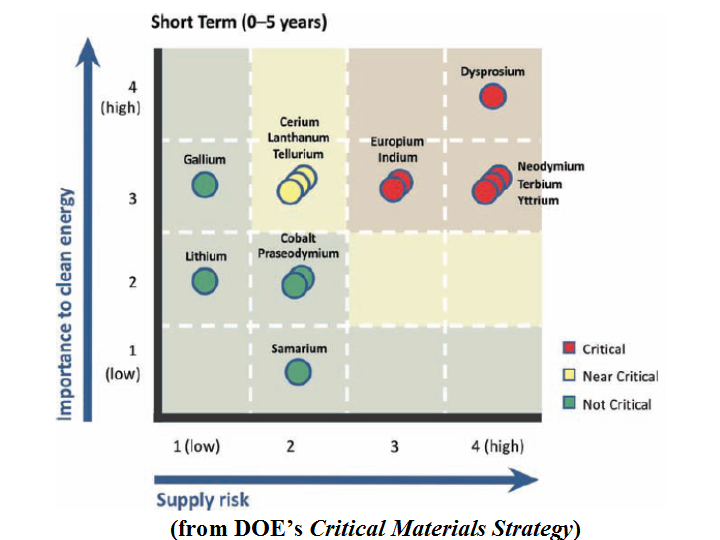 Lack of price incentives…[restrictions on] lithium recycling…[and] limited incentives for utilities using energy storage…[hinder] reuse activities…The lack of valuable materials in batteries [also] often limits the potential for recycling. 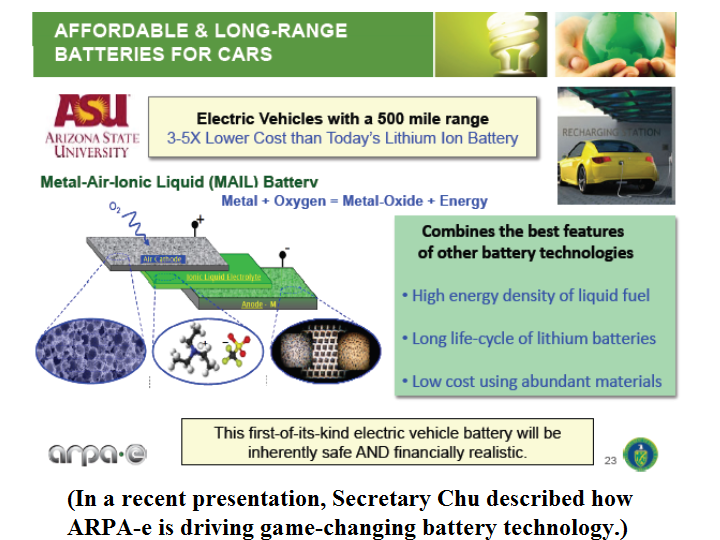 "The advent of Li-ion batteries is expected to spur automotive and utility industries to sell a common fuel electricity to consumers. Furthermore, with second life applications, Li-ion batteries are poised to contribute to further net reductions in emissions…beyond those achieved by using an EV…"
"…With [the first U.S. Geothermal Industry Overview report, they] provide an overview of the U.S. Geothermal industry´s landscape from plants in operation, to those in development and the companies involved." "The U.S. has the largest geothermal industry in the world as it has both the largest installed capacity and the largest development pipeline. While the universe of companies developing new geothermal plants in the U.S. is fairly wide and fragmented, installed capacity is tightly controlled, with the top four operators of geothermal power plants in the U.S. owning 85% of the total capacity." 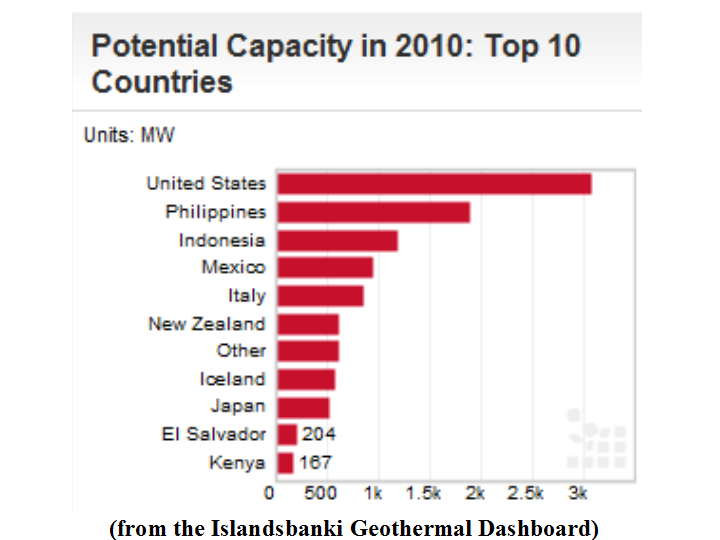 "International players have an important role in development of geothermal power generation in the U.S. About 25% of planned capacity is being developed by companies listed on Canada´s Toronto Stock Exchange." "Gamesa Corp. Tecnologica SA is the most expensive wind-turbine maker based on price-earnings ratios after [speculation about either a bid for Gamesa from a Chinese competitor or a huge conglomerate] boosted its shares 22 percent since October, creating a risk for investors should no offer appear…Julien Desmaretz, an analyst at Bryan, Garnier & Co. in Paris…recommends selling the stock because a takeover…[the company] will underperform competitors. 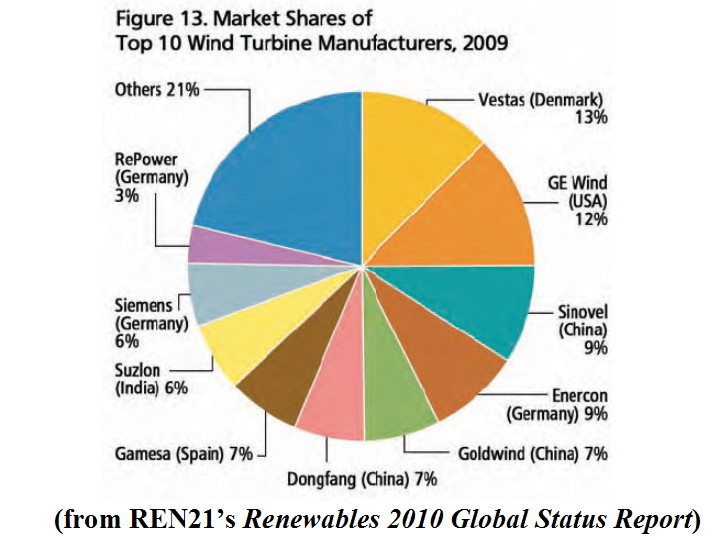 "The Spanish company…trades at 27 times estimated profit…Investors are paying 16 times estimated earnings for Vestas Wind Systems A/S of Denmark, the world’s largest wind-turbine maker, and multiples of 26 for Sinovel Wind Group and 12 for Xinjiang Goldwind Science & Technology Co., both based in China." "Gamesa surged after UBS AG analyst Daniel Stillit identified it as a potential target for Shanghai Electric Group Co. in an October research note. Wind-turbine makers are braced for consolidation after installations slipped last year just as companies ramped up investment in new factories. "Global turbine demand slid for the first time in six years in 2010, falling 5 percent to 35.9 gigawatts, as banks curbed loans to developers…Turbine manufacturing capacity exceeded demand by 37 percent and next year will overshoot by 58 percent, even as installations gain…[C]onsolidation in the turbine-supply industry [is anticipated]…"
"…Gamesa may report 2010 net income of 50.1 million euros ($68.9 million), the median of eight analyst estimates…That’s the least profit compared with market capitalization among its six closest publicly traded rivals…Gamesa was ranked the No. 6 turbine maker with a market share of 6.7 percent in 2009…The company’s current enterprise value of 1.8 billion euros, a measure of a buyout value, is about 5.9 times its estimated earnings before interest, tax, depreciation and amortization. 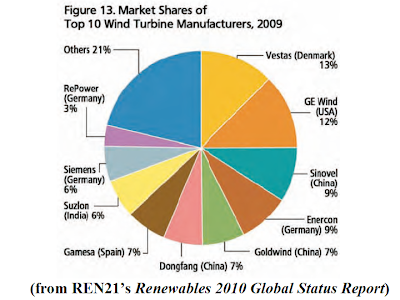 That compares with ratio of 6 for Vestas. "Gamesa aims to boost sales to 4 gigawatts a year by 2013 from about 2.4 gigawatts last year by selling a new range of turbines to the U.S., China and Brazil…The generators will cost 900 million euros to develop over four years and will depress its operating margin to about 4.5 percent next year…Iberdrola SA, the company’s biggest shareholder, has increased its stake to about 20 percent from 15 percent since the plan was announced. The move should be interpreted [according to Iberdrola] as a vote of confidence in Gamesa’s strategy…"
"Under the agreement, ZenithSolar will provide the technology for the installation of two 10 megawatt (MW) cogeneration plants based on ZenithSolar's Z20 CHP system. The Gansu province of China has a population of near 30 million and is located in northwestern China approximately 1,200 kilometers from Beijing. The Gansu Province lies at the edge of the Gobi desert and has the best solar energy conditions in China and among the best anywhere in the world." "The Gansu project represents the first large-scale solar collaboration between China and the Israeli company ZenithSolar in the field of CHP solar energy…ZenithSolar Fast Facts… Combined heat and power generation with 72% efficiency… zero emissions environment…"
"ZenithSolar has developed a modular and easily scalable combined heat and power (CHP) high concentration photovoltaic system (HCPV)…based on a unique, proprietary optical design to extract maximum energy with minimal land usage…[It] provides high electricity output combined with heat at temperatures well suited for domestic hot water…[T]he heat can [also] be used for industrial process applications as well as other cogeneration applications. Zenith Solar has a unique, cost effective mass production capability..."
"A fourth berth in the Bay of Fundy has been awarded to U.K.-based Atlantis Resources to test a tidal turbine, the government of Nova Scotia reported. "Atlantis Resources Corporation is partnering with Irving Shipbuilding and Lockheed Martin to design, build, deploy and monitor the AK-1000 Mark II turbine, one of the world's largest tidal turbines." "The company expects it will cost…$10 million to $15 million to deploy the turbine." 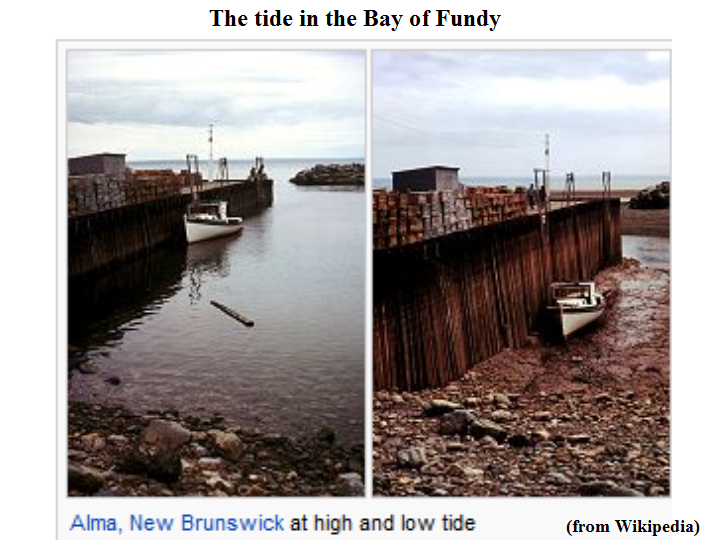 "Atlantis Resources Corporation, Irving Shipbuilding and Lockheed Martin were one of five bidders for the fourth berth in the Bay of Fundy. They join the three existing berth-holders: Nova Scotia Power in partnership with Ireland-based OpenHydro, Minas Basin Pulp and Power and B.C.-based Clean Current." "With one of the highest concentrations of wind generating capacity in Europe--if not the world--the north German state of Schleswig-Holstein plans to double the amount of wind energy it generates from wind turbines on land. "In the spring of 2010, the Conservative government approved a state energy policy that doubles the amount of land area devoted to wind energy. The policy also sets a state target of meeting 100% of its electricity consumption from renewable energy by 2020. 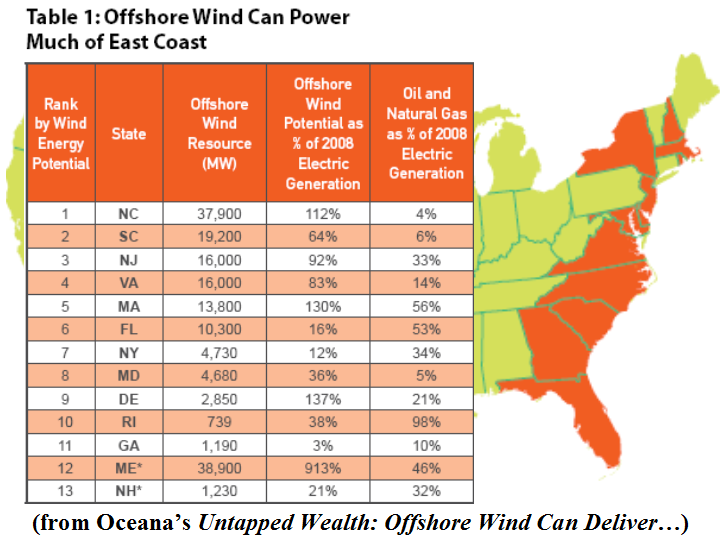 Most of that will come from wind energy." 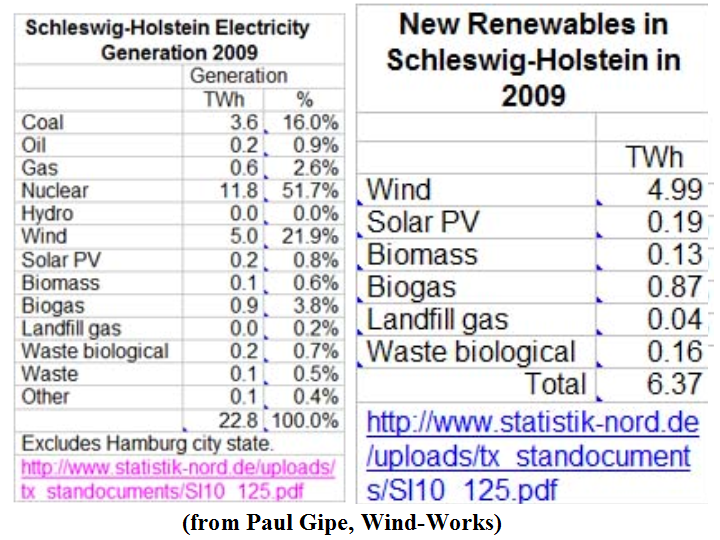 "…Schleswig-Holstein meets more than 50% of its 12 TWh of electricity consumption with new renewables, mostly wind energy and on-farm biogas. Wind turbines currently occupy 0.75% of the state. The new law sets aside 1.5% of the state's land area for wind energy, or double the amount of land currently used. Deutschlands), and the neoliberal Free Democratic Party (Freie Demokratische Partei). About the size of the US state of Connecticut, Schleswig-Holstein is the northernmost Land, or state, in Germany, bordering Denmark on the north and Hamburg and Niedersachsen (Lower Saxony) on the south. The state is one of the windiest in Germany, straddling the German portion of the Jutland peninsula between the windy North Sea on the west and the Baltic Sea on the East…"
"… Within five years, the ruling conservatives expect wind generating capacity to increase from the current 3,000 MW to nearly 5,000 MW…Equally striking is the plan to nearly triple solar photovoltaics (PV) by 2015 from 540 MW in 2009 to 1,400 MW--as much as was installed in the US through 2009…On-farm biogas…generated nearly 1 TWh in 2009 from more than 300 plants. By 2015 Schleswig-Holstein expects to have 300 MW in operation from more than 600 plants…. 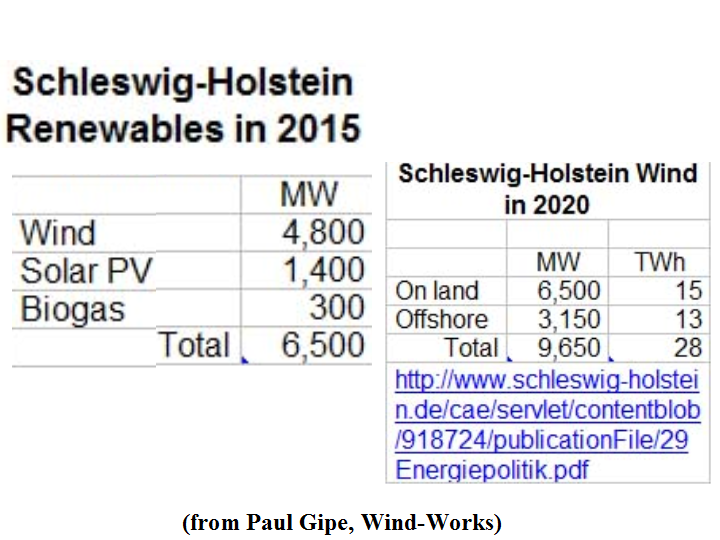 [O]nly 50 MW [are] in operation in the US from 150 plants…The population of Schleswig-Holstein, 2.8 million, is less than 1% of that of the US, and about 10% of Canada's 35 million inhabitants…[W]ith a land area of only 16,000 square kilometers, [Schleswig-Holstein] is less than half the land area of Denmark …[but] now has more than twice the wind-generating capacity per square kilometer as Denmark, more than any other German state, nearly eight times more than Iowa, and 32 times more than California…"
"Oman-based Phoenix Solar L.L.C., a subsidiary of Phoenix Solar AG (ISIN DE000A0BVU93), an international photovoltaic system integrator listed on the German TecDAX, is to build a solar park with a peak power of 3.5 megawatts for the Saudi Arabian Oil Company (Saudi Aramco). Saudi Aramco, the world’s largest oil producing company, commissioned Phoenix Solar last year to install a photovoltaic testing field designed to analyse different module technologies at its headquarters in Dhahran. "The solar power plant will be built on land where the King Abdullah Petroleum Studies and Research Center (KAPSARC) is currently under construction - close to Riyadh, the capital of Saudi Arabia. KAPSARC itself is the largest energy research centre in the world. The construction of KAPSARC is geared towards achieving LEED Platinum certification. The Leadership in Energy and Environmental Design (LEED), developed by the U.S. Green Building Council, is a system which rates green building and sets standards for sustainable building." "Together with Naizak Global Engineering Systems, its local project partner in Saudi Arabia, the task of Phoenix Solar will be to design and build the grid-connected ground-mounted photovoltaic plant by the end of September 2011. Phoenix Solar’s principal is M.R. Khathlan (MRK), a Saudi company which, in its capacity as general contractor, will design and build the electricity and water supply of KAPSARC. 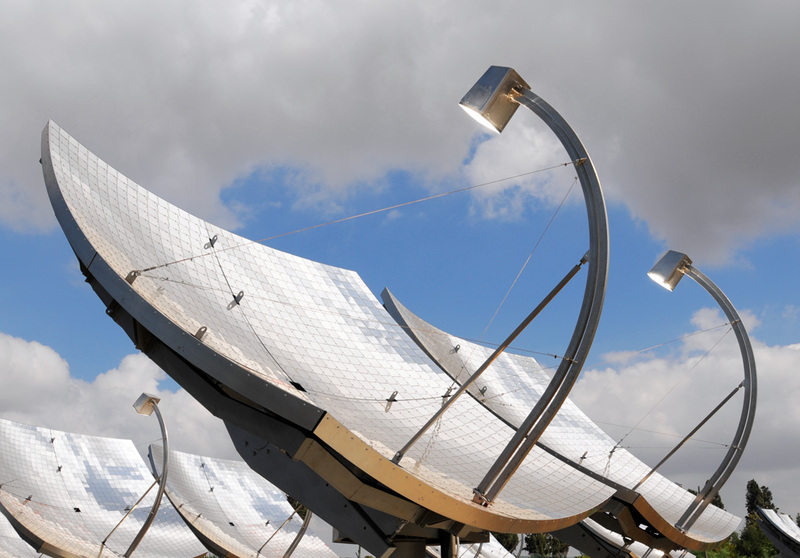 "The photovoltaic project was awarded through an international bidding procedure. Alongside Phoenix Solar’s cutting-edge competence in power plant construction and the presence of the company in the Gulf region, a determinant factor for winning the contract was the experience gathered by Phoenix Solar from the test facility…"
"Crude prices have jumped 20% in the week since the Libyan people's uprising against the regime of Moammar Gadhafi escalated and turned violent. Investors around the globe worry that other Middle Eastern producers could be engulfed by similar chaos." "China National Petroleum Corp. (CNPC), China's largest oil producer, [also confirmed] that its facilities in Libya recently came under attack, marking the first confirmation of violence against oil producers in the country…Chinese media described a raid on oil facilities in Misurata, Libya's third-largest city, saying it targeted CNPC unit Great Wall Drill Engineering Co. and caused ‘tens of millions’ of renminbi in damage. It said that cars were stolen and employees' personal belongings were looted." "According to one analyst, news of the attack on CNPC will only heighten concerns among oil industry executives that the civil unrest in Libya could lead to widespread sabotage of oil facilities, a point underlined by Seif al-Islam Gaddafi, the son of leader Moammar Gadhafi, who warned that in the event of a civil war, Libya's oil wealth would be ‘burned.’"
"…[The annual White House economic report rebuts] GOP claims that President Obama’s energy proposals amount to ‘picking winners and losers’ among energy technologies and are too costly. "…[Transitioning to a Clean Energy Future from the 2011 Economic Report of the President] touts Obama’s proposed 'clean energy standard' (CES) that would require utilities to supply increasing amounts of power from low-carbon sources." 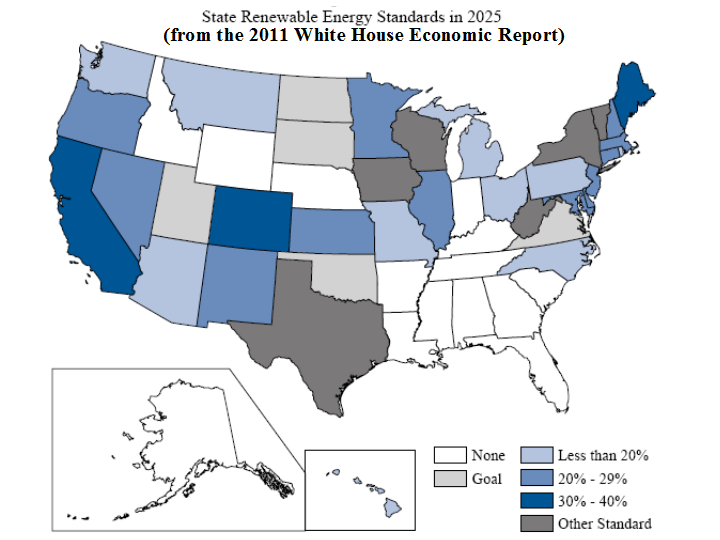 "The report delivered to Congress says a ‘clean standard’ would complement the White House push for increased spending on green-energy research and development (R&D) without playing favorites." "Obama’s plan calls for a doubling of electricity from low-carbon sources including renewables, nuclear power, natural gas and power from coal plants that trap carbon emissions (a technology not yet commercialized). 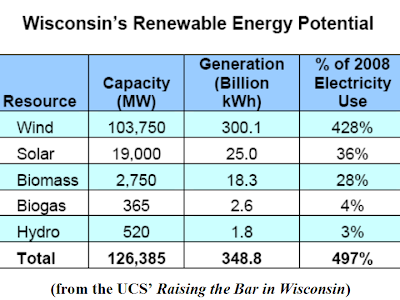 It sets a target of obtaining 80 percent of U.S. power from these sources by 2035…The report also says a CES would complement the renewable energy standards in place in roughly 30 states…[and add] the cost-effectiveness benefits of a national standard…"
"As American kids, we were raised on the culture-defining parable of The Little Engine that Could...Is it possible to power [the] steam engine of economic growth with renewables like wind and solar instead of coal and oil? "…Greenpeace embarked on a two-year process to develop a Global Energy Scenario in cooperation with the Stockholm Environment Institute. The study was published in 1993, and showed how the world could transition out of fossil fuels (and nuclear power) by 2100…In the past few years, subsequent studies have shown that a 100% renewable energy economy would be possible in a far closer time horizon -- 2050, 2040, even 2030…2009 was unprecedented in the history of renewable energy…In 2010, for the first time, investments in new wind power capacity by developing countries and emerging economies outstripped those of the developed nations…"
"…Renewables are here. The little blue engine is getting faster and faster…[W]hat now stands in our way? 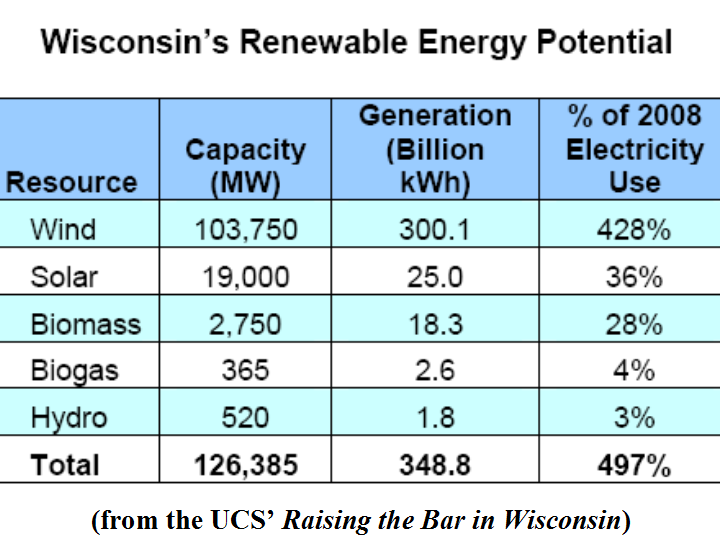 [Wisconsin’s] Tea Party Governor Scott Walker… is using the threat of bankruptcy to put an end to the unions along with the state's burgeoning clean energy sector." "While Walker's actions sound an awful lot like the union busting of the first industrial revolution, this time there's a difference. He doesn't just want to destroy the unions. He also wants to take down the renewable energy industry that will provide those unions with a wave of new employment opportunities in the decades to come. "It's clear that the little renewable engine could make it up that hill if left to its own resources. 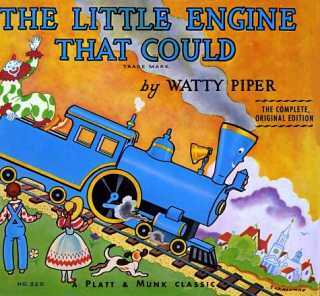 But can it do so with a monster Tea Party train, loaded up with coal, breathing down its neck? That is another question." 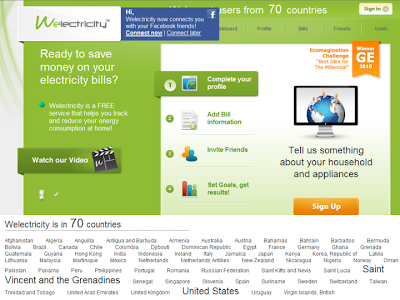 Can Social Networks Lead to Energy Efficiency? "We’ve seen once again the power of social media as witnessed by recent events in Egypt…[where] Facebook is credited with fomenting a popular uprising that toppled a government. "Social media has obviously grown from its origins as the domain of the mundane, providing millions of people with a platform to share common interests no matter where they are…[Years ago, a college student] raised millions of dollars in a matter of months to aid Darfur by connecting [via Facebook] with students at other campuses across the country. Other causes have followed suit and businesses have embraced social media…"
"Given the current public rumblings over smart meter deployments as a privacy issue, it will be interesting to see if people embrace the idea of sharing electricity usage among neighbors or complete strangers, who would otherwise be suspicious of utilities extracting data from their consumption patterns." "Since its inception more than 50 years ago, the U.S. nuclear power industry has been propped up by a generous array of government subsidies that have supported its development and operations. 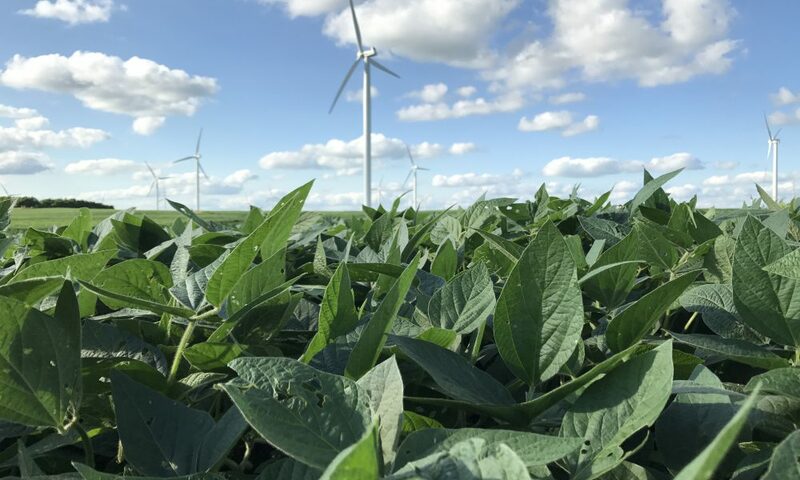 Despite that support, the industry is still not economically viable, according to a report released today by the Union of Concerned Scientists (UCS). 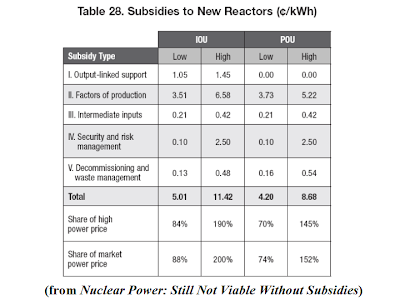 "…[Nuclear Power: Still Not Viable Without Subsidies] found that more than 30 subsidies have supported every stage of the nuclear fuel cycle, from uranium mining to long-term waste storage…[and] often have exceeded the average market price of the power…Pending and proposed subsidies for new nuclear reactors would shift even more costs and risks from the industry to taxpayers and ratepayers. The Obama administration’s new budget proposal would…[bring] the total amount of nuclear loan guarantees to a staggering $58.5 billion, leaving taxpayers on the hook if the industry defaults on these loans." 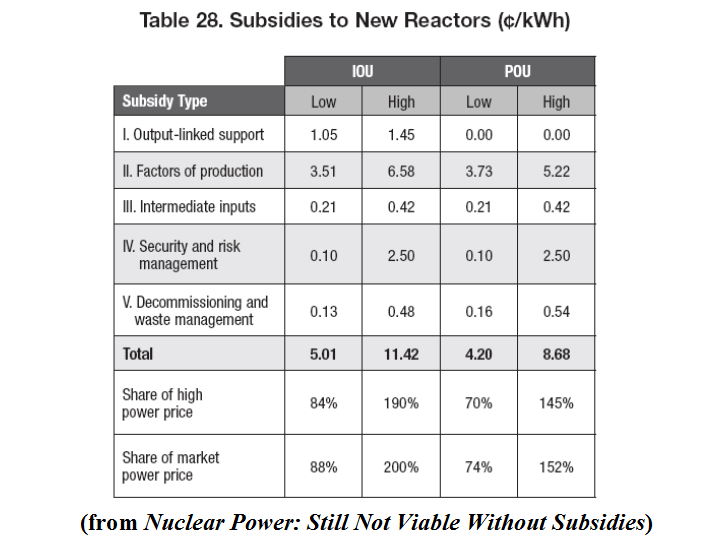 "The key subsidies for nuclear power do not involve cash payments…They shift the risks of constructing and operating plants -- including cost overruns, loan defaults, accidents and waste management -- from plant owners and investors to taxpayers and ratepayers. These hidden subsidies distort market choices that would otherwise favor less risky investments. 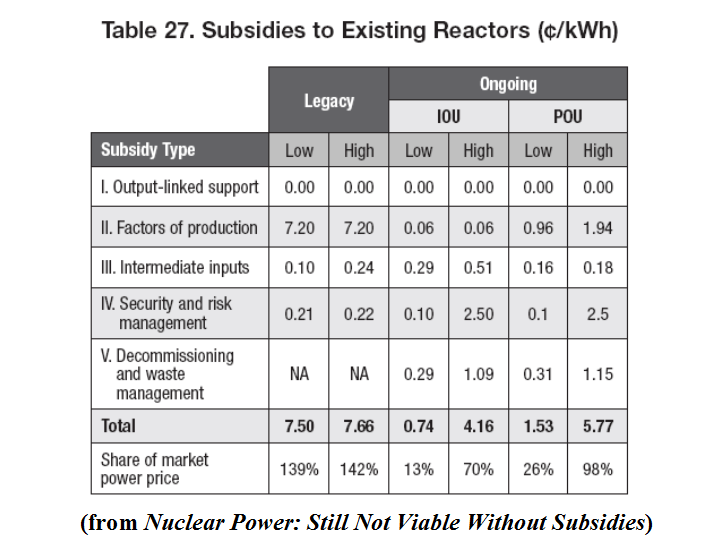 "The most significant forms of subsidies to nuclear power have four principal objectives: Reduce the cost of capital, labor and land through loan guarantees and tax incentives; mask the true costs of producing nuclear energy through subsidies to uranium mining and water usage; shift security and accident risks to the public via the 1957 Price-Anderson Act and other mechanisms; and shift long-term operating risks such as radioactive waste storage to the public." 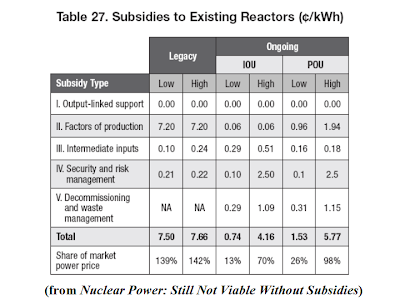 "The report evaluates legacy subsidies that helped build the industry, ongoing support to existing reactors, and subsidies available for new projects…[L]egacy subsidies…were more valuable than the power the subsidized plants produced…The industry continues to benefit from subsidies…The exact value of these subsidies…is difficult to ascertain…[but ranges] from 13 percent to 98 percent of the value of the power produced…[and] [s]ubsidies to new reactors could significantly exceed those enjoyed by the existing fleet…The report estimates that these subsidies could be worth…as much as 200 percent of the projected price of electricity when these plants are built. "…[The] report recommends that the federal government reduce subsidies to the nuclear power industry…award them competitively to the most cost-effective low-carbon energy technologies…[and] modernize liability systems for nuclear power…[with] regulations and fee structures for uranium mining, waste repository financing, and water usage that fully reflect the technology’s cost and risks…"
Connections are hard to make and harder to maintain but when they fall into place everything flows more efficiently and effectively. It is possible to be rich in a single energy resource and still be impoverished by its limitations. Some energy sources are cheap but debilitatingly dirty. Others are abundant but problematically variable. Because there is no single energy resource right now that solves every energy need everywhere, the wise choice is to be connected. Build an energy-carrying infrastructure to share many regions’ resources and build an energy-trading forum so the regions can meet in the marketplace and see to their own unique and fluctuating needs. The report highlighted below is another in the four-part Smart Power Market Project (see last week’s first post, POWER MARKETS FOR NEW ENERGY). The Project is an assessment of Europe’s effort to include the New Energies into an advanced, comprehensive and efficient energy marketplace. Connection-building comes more readily to Europe, where efforts to be loners and cowboys only led to disastrous and tragic wars over the last five centuries. The U.S. is still struggling to hear its better angels’ chorus singing about a comprehensive national energy policy and a new national transmission system. Here’s hoping the 2010 fires in Russia and floods in Pakistan and the 2011 horrors in Australia will be enough and further consequences of an increasingly tempestuous and severe climate aren't necessary for this nation’s electorate to hear the deep soul and soaring harmonies of the New Energy choir singing about this good earth's sun, wind, deep heat and flowing waters. 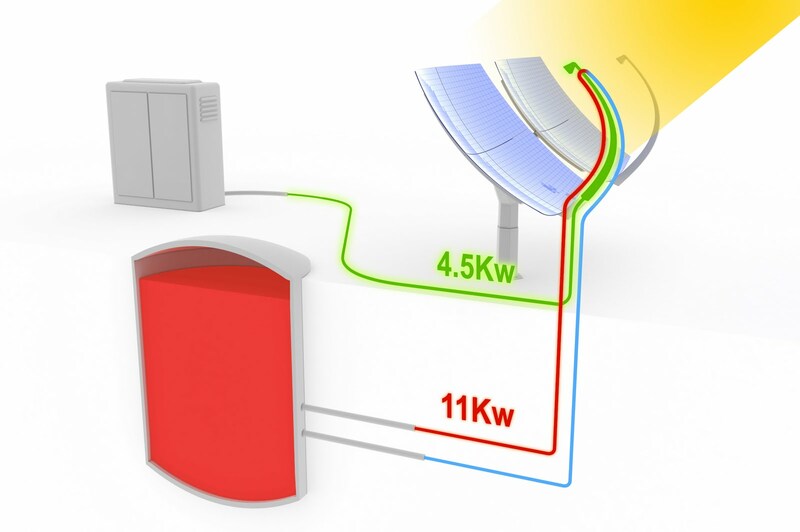 EU Member States increase deployment of intermittent renewable energy sources to deliver the 20% renewable target formulated in the European Renewables Directive of 2008. 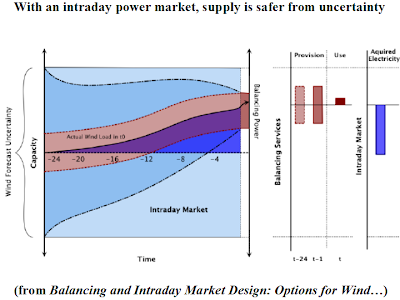 To incorporate these intermittent sources, a power market needs to be flexible enough to accommodate short-term forecasts and quick turn transactions. This flexibility is particularly valuable with respect to wind energy, where wind forecast uncertainty decreases from 15% to 4% in the last 24 hours before actual generation (from observed data in Germany). Therefore, intraday and balancing markets need to be adjusted to make full use of the flexibility of the transmission system and the different generation technologies to effectively respond to increased uncertainty. The paper explores whether the power market designs in European countries offer opportunities and incentives for market participants to realise these technological opportunities. - to ensure that the least cost generation capacity provides power and ancillary services. - to reduce the amount of capacity needed to provide balancing services and to operate on part load. - a broader set of actors can contribute energy and balancing services in day-ahead and intraday markets if they can coordinate sales across adjacent hours (thus more accurately reflecting technical constraints of power stations like ramp-up rates or start-up costs). - the transmission network is the most flexible component of the power system, but requires fully integrated intraday and balancing markets to replace more costly generation assets and enhance system security. - creating incentives and systems that allow the demand side to fully contribute to the available flexibility. - to ensure that cost-reflective intraday pricing bids encourage efficient dispatch choices and 1.) 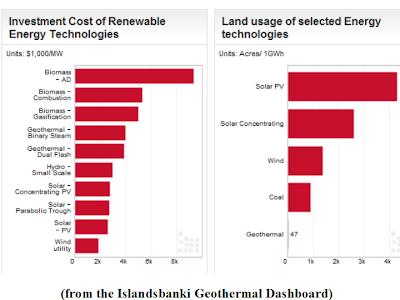 Limits costs for integrating intermittent renewables, 2.) Reduces the risk for market participants exposed to intraday adjustments, and 3.) 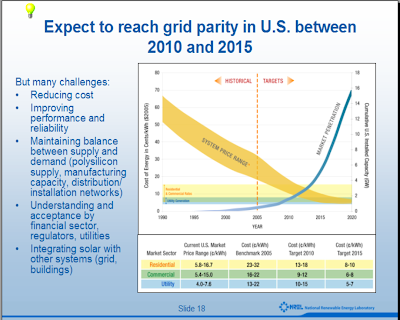 Limits the need for utilities to balance within their portfolio and thus increases participation. 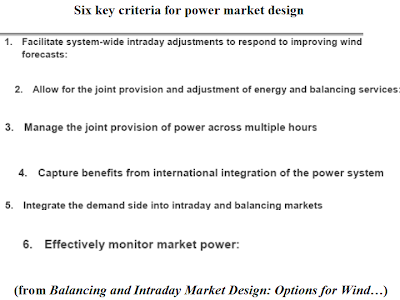 When evaluating market designs based on these six criteria, it becomes apparent that none of the current power market designs applied across European countries fully meets all of them. 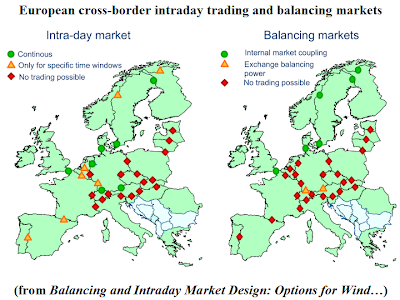 The approach used in the US (locational marginal pricing/nodal pricing), however, provides appropriate price signals for the economic design and evaluation of the EU power grid and encourages the effective use of transmission capacity while improving interfaces between balancing and intraday markets. The EU has made some progress towards integrating power markets, but today’s intraday and balancing market designs are far from a fully efficient and harmonised market. In the third Energy Package, the EU laid out a path for further regulatory harmonisation, which aims to foster a common energy market. The paper provides criteria that the market design must satisfy in order to support the large scale integration of renewables. 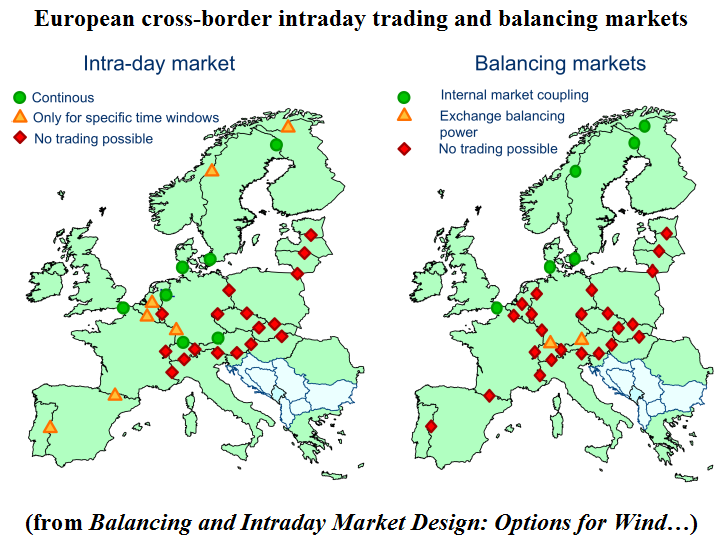 It illustrates the value and importance of closely integrated operation and market designs for the European electricity system. The growing share of wind and other intermittent generation sources in the European power supply increases the uncertainty about power production in day-ahead and longer-term predictions2. More accurate forecasts closer to production time reduce this uncertainty. 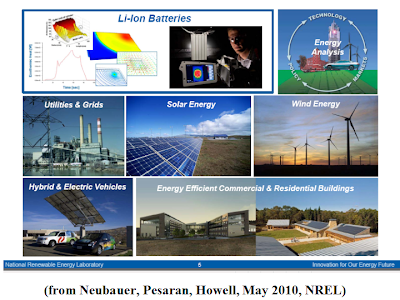 This paper provides six criteria that power market designs need to satisfy in order to allow market participants and system operators to make full use of this information and thus limit the uncertainty and facilitate integration of intermittent renewable energy sources at lower costs and larger volumes, while also increasing system security. European Member States and the Commission have committed in the EU Renewables Directive to the large-scale deployment of intermittent renewable energy sources across Europe and are assessing barriers that could cause delays and increase costs. 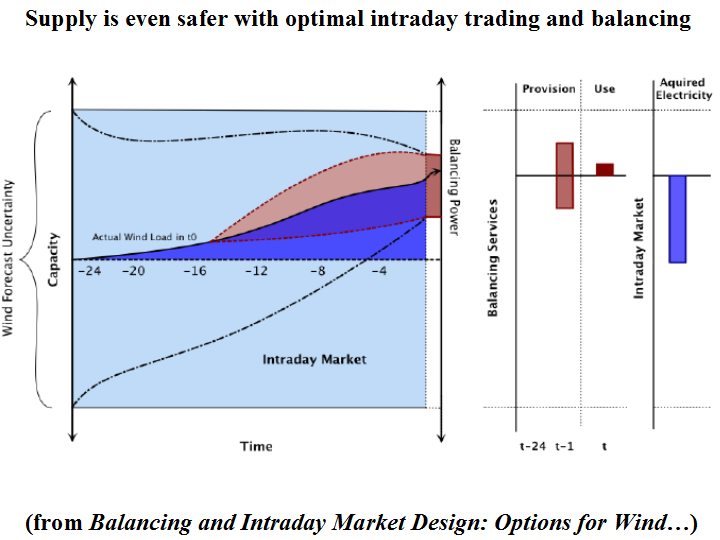 1) Day-ahead markets that clear the day before power is provided; 2) Intraday markets that allow for adjustments after the closure of the day-ahead market until gate-closure, typically about one hour before real time; and 3) Balancing markets that are used by the system operator to resolve remaining imbalances. How does their design and limited integration across time and countries, constrain the full use of flexibility that generation, transmission, and demand can offer, and what options exist for improvements? Historically, balancing markets have been the only markets to provide reserve and response operations. System operators contract this reserve and response capacity in day-ahead and longer-term markets with generators to provide flexibility that can be called upon on short notice to balance the system when forced power plant outages or load prediction errors occur. Balancing was only necessary for events of small probabilities (power station failures) or for small volumes (as in the case of load prediction errors); the amount of reserve capacity contracted was thus large compared to the small share of actual electricity requested. Balancing services were provided nationally, or in the case of Germany, within the region of the TSO. Mutual support between regions was restricted to emergency situations, such as unexpected power plant failures, and not remunerated (only energy that was provided had to be returned). 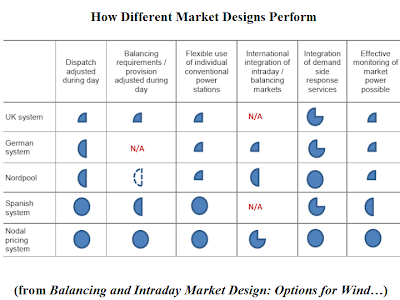 Most power markets imposed penalties for deviations from day-ahead schedules to limit demand for balancing power. 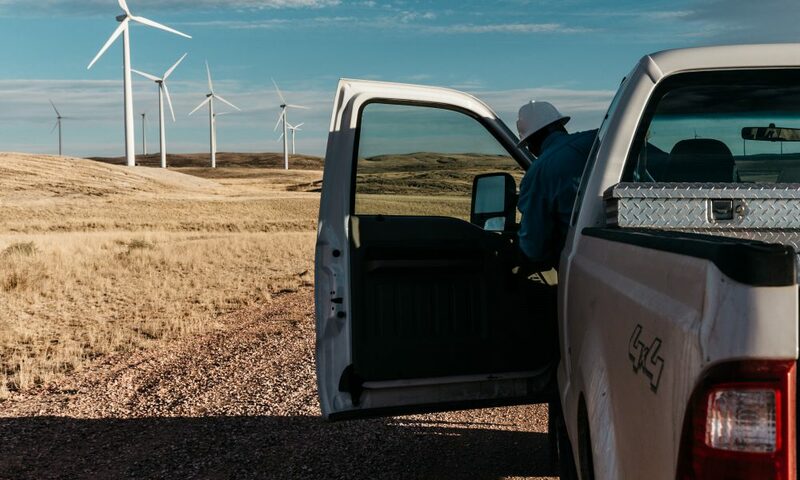 In recent years renewable energy and newly installed wind power have prompted additional demand for reserve and response operations. This demand arose predominantly due to the uncertainty of day-ahead forecasts for renewable feed-ins. This trend will continue as EU Member States increase the deployment of wind power and other intermittent renewable energy sources to deliver the 20% renewable target formulated in the European Renewables Directive of 2008. 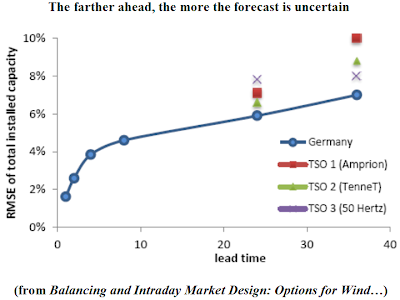 Therefore, intraday and balancing markets need to be adjusted to allow the TSOs to appropriately respond to increased uncertainty. The forecast error for wind decreases distinctly with a shorter lead-time (DENA, 2005; DENA, 2010; Focken et al, 2002; Von Roon and Wagner, 2009). 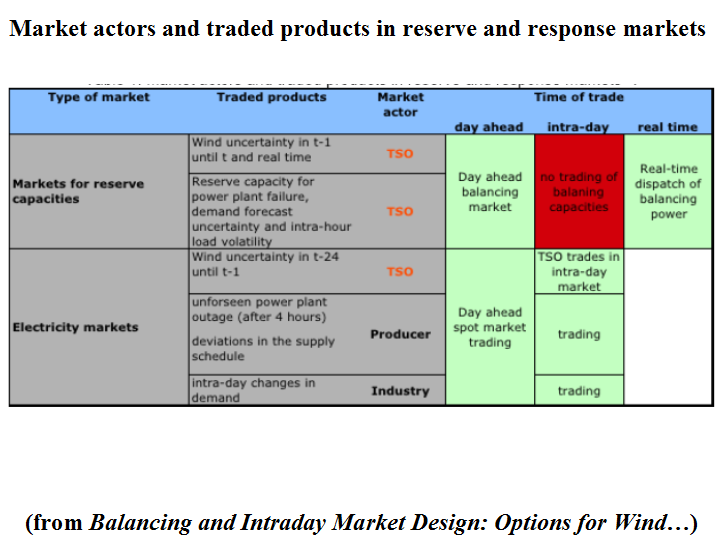 In markets unable to adapt to changing wind forecasts during the day, large volumes of real-time balancing are required, and because of the high uncertainty of wind 24-36 hours ahead of physical feed-in, a significant amount of balancing reserve capacity is required. EWIS (2010) and Tradewind (2009) quantify the resulting additional costs for electricity generation due to the increased start-up and part-load costs to provide balancing power. 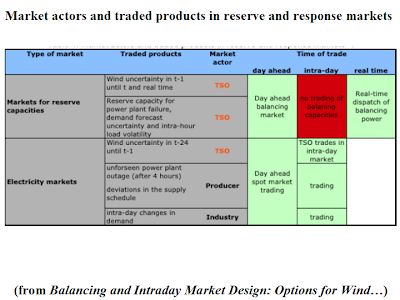 Different studies (Muesgens and Neuhoff, 2002; Tradewind 2009) point out that system costs for balancing wind uncertainty can be significantly reduced if an improved market design allows for optimisation of dispatch across the entire system based on wind forecasts with lead-times reduced to 1-4 hours ahead of physical dispatch. In addition, the design of markets for intraday balancing and markets for improved congestion management can also increase efficiencies. The power system has to deal with three main sources of uncertainty: demand uncertainty and load prediction errors3, failure of power plants, and the uncertainty of wind. 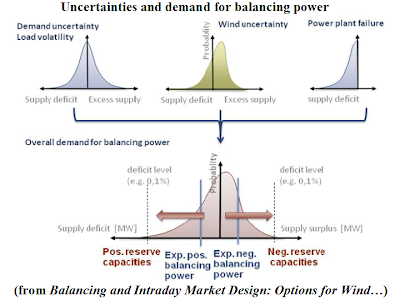 Figure 1 illustrates that the aggregate uncertainty about the balance of power supply and demand increases with uncertainties of the individual components.  Uncertainty about wind projections decline during the last 24 hours. The demand and supply uncertainty that has to be balanced in real time can be reduced significantly if additional information and updated wind forecasts within the last hours before physical dispatch are used effectively. correlated (Dany and Haubrich, 2002). The factor that can contribute the biggest real-time imbalance of supply and demand is likely the failure of large power stations or transmission lines. 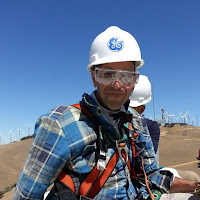 If uncertainty in predictions of wind output is smaller than uncertainties about other factors, it might only have a small impact on real-time balancing needs. There are three ways to reduce uncertainty. 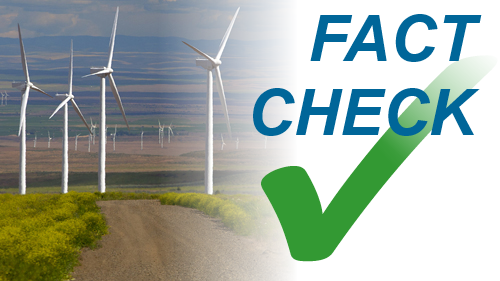 The accuracy of the wind power forecast has significantly improved in recent years. In Germany, the 24h forecasting error5 for the aggregate output from German wind turbines was significantly reduced from 6.1% in 2007 to 5.6 % in 2008 (Von Roon and Wagner, 2009). Future improvements of wind forecasting can be obtained based on improvements of the available wind models as well as their coupling. Further improvements of wind models will lead to an increase in forecasting accuracy in the coming years. The German DENA II study (DENA, 2010) predicts forecast errors onshore might be reduced by as much as 41% by 2020.
. In short, improved wind forecasts alone will not be enough to reduce uncertainty sufficiently - we need to consider other options for reducing or managing uncertainty. Large wind areas can reduce uncertainty in the overall wind feed-in. 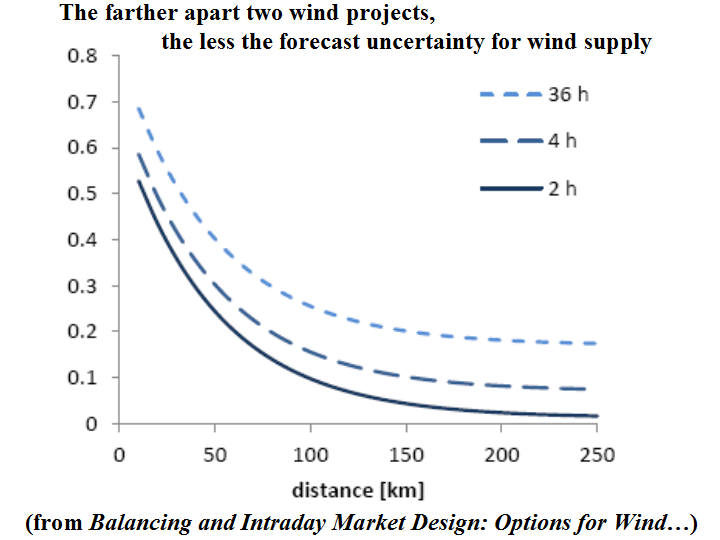 The correlation of wind feed-in and uncertainty strongly depends on the distance between wind farms (Figure 4) and therefore also on the size of the investigated area. This effect can be observed even for significantly large areas. The integration of the German transmission system operators (TSOs) into one market in 2009 provided a good example. 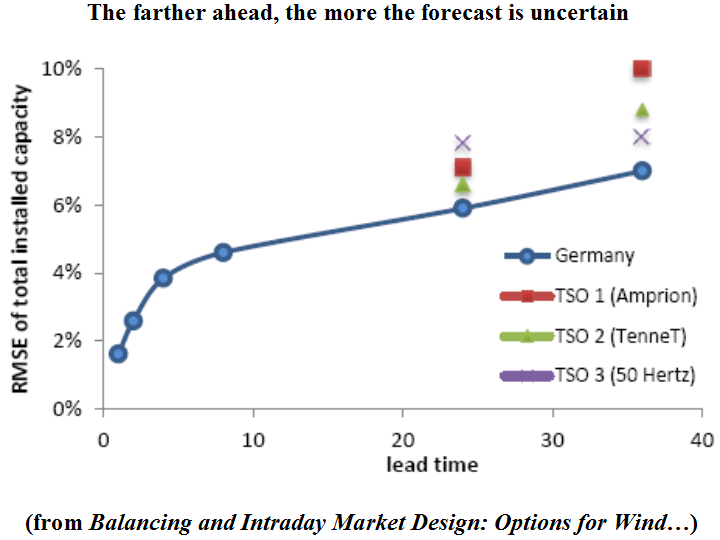 The day-ahead (24h) forecast error (RMSE) for each of the four TSOs was between 6.6% and 7.8%. Bundling the region reduced the forecast error to 5.9% (Figure 3). 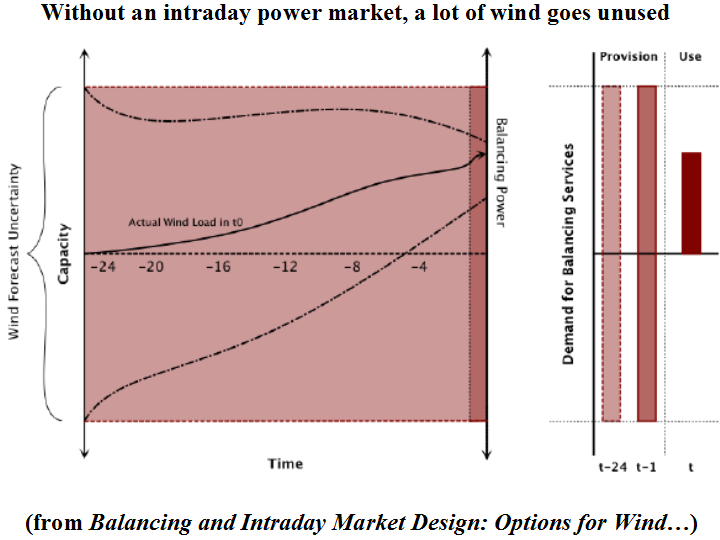 This paper focuses on these last two opportunities and thus investigates the institutional perspective: reducing lead time through 1) intraday markets and by 2) increasing the size of wind areas. All long-term electricity scenarios show a large increase in installed wind capacities within Europe in the coming decades. Despite significant improvements in wind forecasting, the day-ahead forecasts will induce increasing uncertainty into the European electricity system. 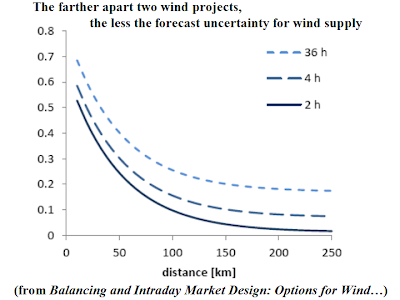 It will therefore be essential to make use of two factors: the improving wind forecasts within the hours between the day-ahead market and real-time dispatch, and the full flexibility that the generation, transmission, and demand side of the power system can offer to limit cost increases to deal with this (wind-) uncertainty and to ensure full system security. 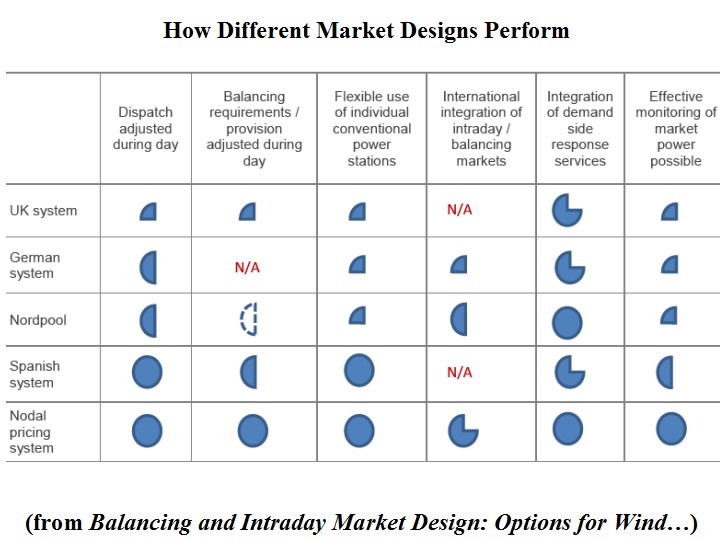 When comparing market designs based on these six criteria, it becomes apparent that none of the current power market designs applied across European countries fully meets all of them. 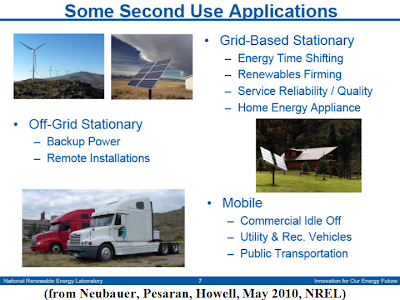 In contrast, the power market design that has been initially used in PJM and by New York ISO and that has since been adopted in Texas and California does satisfy all six criteria listed in this paper. The assessment in the accompanying paper on congestion management suggests that the PJM type power market design (locational marginal pricing) also performs well with regard to the effective usage of transmission capacity. Given the positive attributes of an alternative design, this raises the question of whether the current process of gradual EU power market design improvements can facilitate the implementation of such a design. The paper argues that more coordination and initiative at the EU level will be necessary to facilitate the effective operation of the common European markets. While some of the stakeholders might be reluctant to contribute to such a development, European consumers will benefit and EU Member States will be supported in their achievement of the renewable targets formulated in the EU renewable directive. The third Energy Package provides opportunities to complement the bottom-up approach pursued so far on European power market design with top-down requirements. One cornerstone of the Energy package is the centralized organizational structure that is currently in place. 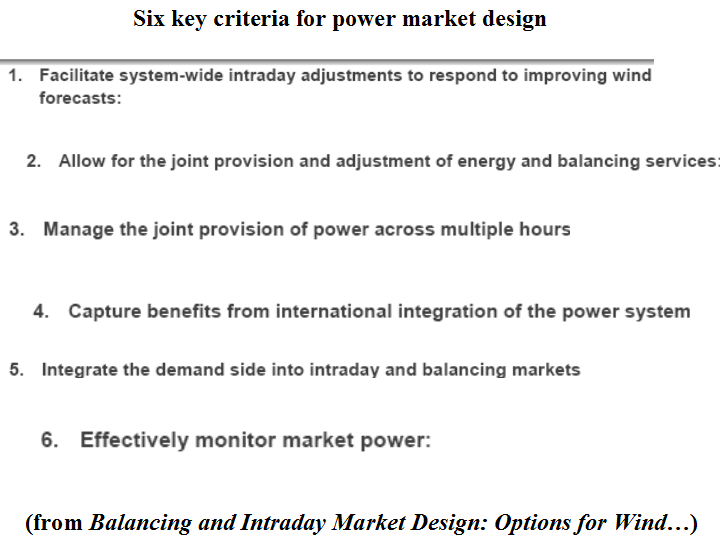 As many market participants have disincentives to fully support a bottom-up transition to an integrated power market design, the provisions from the Energy Package might become essential in the European pursuit of a harmonized and effective power market design. 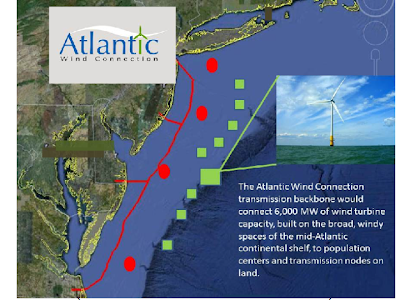 "…In filings with the Federal Energy Regulatory Commission (FERC), both the state Board of Public Utilities (BPU) and the New Jersey Division of Rate Counsel expressed concern about the Atlantic Wind Connection project, a $5 billion submarine high-voltage transmission backbone…[T]he two agencies argued that the project, stretching from Virginia to New Jersey, could adversely affect the rates paid by consumers and also place much of the risk on the ratepayer instead of the developers. "The Atlantic Wind Connection is a 350-mile underwater transmission line, which aims to connect the spate of offshore wind farms being developed by New Jersey and other states. 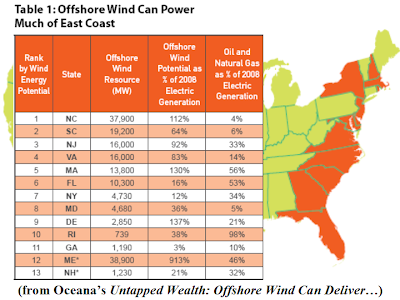 Its backers include Google, and Trans-Elect, a transmission company…[It] has been viewed warily in New Jersey by both regulators and offshore wind developers, who already have lined up their own interconnections with the regional power grid, and at a far lower cost than what Atlantic Wind Connection envisions…"
"New Jersey officials, however, remain unconvinced…Consumers already pay some of the highest electric bills in the nation, a burden some argue could increase as the state shifts to cleaner sources of energy, such as solar and wind power. According to the Rate Counsel, if current state policies remain in effect, subsidies to develop solar and wind power projects could cost consumers an additional $5 billion over the next two decades." 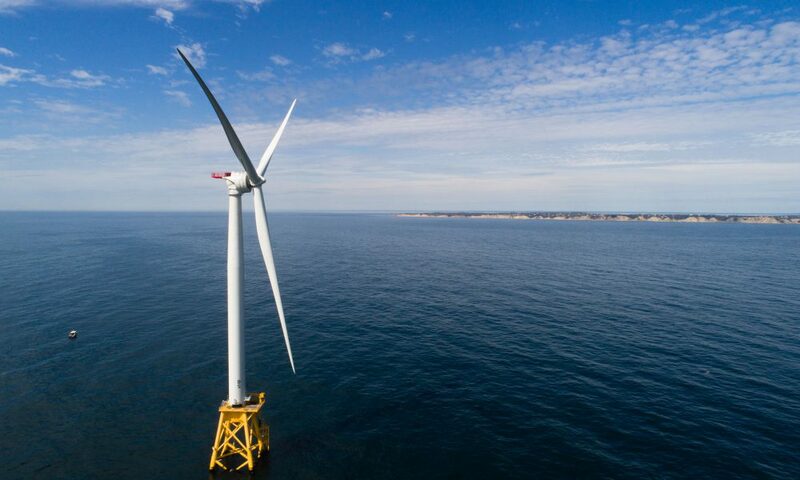 "…[The Atlantic Wind Connection’s] Mitchell said the developer hopes to clear the federal agency review within a couple of months." "Xcel Energy, a U.S.-based electrical and natural gas company, has changed its Solar*Rewards program to include an immediate reduction in the combined program incentive and a filing with the Colorado Public Utilities Commission (CPUC) for approval to lower the rebates offered through the program for on-site solar energy installations. "The combined Solar*Rewards incentive for small, customer-owned systems (0.5 kW to 10 kW) will now be paid at $2.01/W, down from the former $2.35 per watt. The medium and third-party-owned programs will be adjusted similarly. There will be no incentive change for applications that have already been approved." "Xcel Energy says it also is filing with the CPUC for approval to change the rebates for participants at the four program levels…[O]n commission approval, Xcel Energy plans to offer a combined incentive of up to $1.25/W for small systems. "The changes are prompted by the decline in solar panel costs and increasing subsidization from government programs, according to Xcel Energy. Together, these developments have reduced the level of incentives needed to support customer participation…"
"…[In An Advanced Lithium Ion Battery Based on High Performance Electrode Materials, researchers Jusef Hassoun, Ki-Soo Lee, Yang-Kook Sun, and Bruno Scrosati, from the University of Rome Sapienza in Rome, Italy, and Hanyang University in Seoul, South Korea, report having] developed a novel type of lithium-ion battery with an anode and cathode that involve new, advanced battery chemistries, greatly improving the battery’s performance and likely making it suitable for electric vehicles…"
"The new [high-voltage cathode and a nanostructured anode] materials provide certain advantages for the overall battery. As the researchers previously demonstrated, the tin-carbon anode has a high cycling life of several hundred cycles without a reduction in capacity, as well as discharge-charge efficiency approaching 100%. By applying a surface treatment to the anode, the researchers could further improve the capacity." 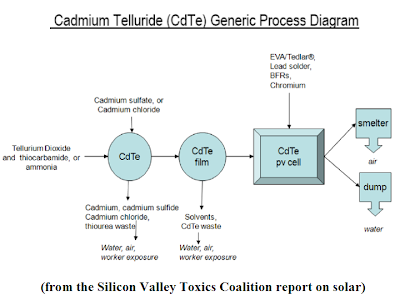 "…[T]he new manganese-based cathode materials…are more abundant, less expensive, more environmentally friendly, and have a higher stability at low temperatures compared to the lithium cobalt oxide cathode used in conventional lithium-ion batteries…[with carefully optimized] composition, particle size, shape, morphology, and tap density…The cathode’s high voltage and high capacity provides the new battery with a higher energy density (170 Wh/kg at average discharge voltage of 4.2 volts) than conventional lithium-ion batteries…"
"…Many of the materials in question are now traded in relatively small volumes, but are becoming increasingly critical to the production of clean energy technologies, according to the report by the American Physical Society and the Materials Research Society…[Materials] like indium, gallium and tellurium, until a few years ago were mainly ‘laboratory curiosities’…But shortages…could slow the deployment of green technologies…"
"Because the copper business on which tellurium is piggybacked was about $80 billion in 2009, while the tellurium market was but a tiny fraction of that — close to $30 million — it is unlikely that producers will expand copper mines simply to yield more tellurium…Gallium, indium and germanium are other elements for which demand is now low but might grow far faster than production could be increased…Production of those materials today is generally a byproduct of something else, and not a result of primary production of the elements themselves. So investors may not want to build mines or processing plants just for those elements, the study said." "The report put lithium in this category. 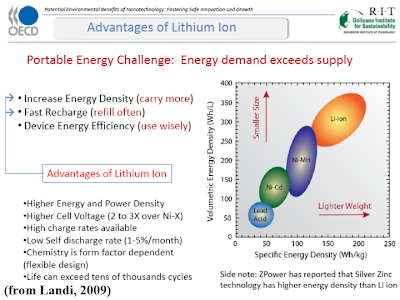 It is important to batteries, but substitutes might be found, and that means that exploration and development of new lithium resources [is in limbo]…[N]o one is sure about how fast production of these “energy critical elements” could be increased, the study said…[D]eveloping and opening a new mine can take decades. "Another complication is that mining many of the materials also brings to the surface uranium and thorium, which are radioactive. 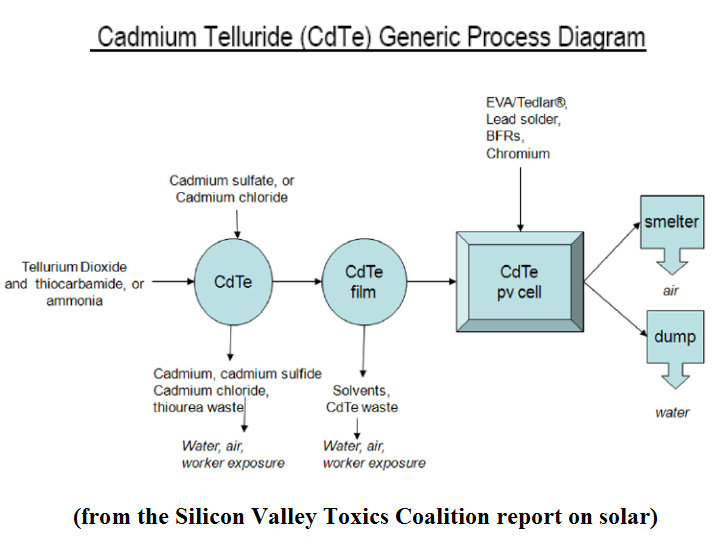 The uranium and thorium often occur in concentrations too low to be commercially attractive, so they are cast aside as byproducts, creating environmental problems…The report said the White House Office of Science and Technology Policy should create a committee to examine the production and use of these energy-critical elements, and aim to enhance their production…find substitutes [and recycle them]…"